Took this one right off Pinterest. I’ve hours on it, about time I actually learned something right? So I had this one egg sitting in my fridge. Couldn’t really make anda bhurji with just one egg, and the omelette would have been too too thin. So I used a capsicum and tomato to fashion this amazingly trendy omelette loaded with cheese. I am gonna do the photos all the talking here. Cool eh! I think you can simply mix and match the veggies. Maybe add onions, mushrooms and carrots. Unintentionally looks like the Indian flag here! I’ve cut a thin horizontal slice off the capsicum here and placed it on an oiled pan. I broke the egg in the middle and tried to keep it within the capsicum boundaries. If it’s a small capsicum, then you might have trouble keeping the egg within the green lines. Season with salt and pepper, and add tomatoes and chilies. Grate or just cut up some cheese on it and enjoy. Baby food in trains! Is it safe? I remember whenever my sister travels in train with her two kids — one aged 11 and the other 2 — she carries with her a big bag of food supplies with her. It includes bread, thepla, biscuits, chikki, chocolates, some fruits, ceralac, milk, milk powder (just in case), juice, thermos and an electric kettle. I won’t give my kids train food, she would say. She would carry one fresh meal like puri-sabji, and then use something from the above mentioned supplies till the time they reached their destination. My mother-in-law once told me about the time their train got super-delayed and the small station where it was stuck at had no shops at all. Not expecting this 12-hour delay, she was not carrying any food with her, but my husband, then just a toddler, had to be fed! Kind co-passengers helped her with milk and bananas, and after that, she never leaves the house without food and water in her purse. Photo courtesy Railway Ministry’s twitter account. Mothers, who travel with their babies, have welcomed the Railway Minister’s move to provide facilities like baby food and baby boards in trains, but expressed apprehensions about the quality of food. Almost every mother whom I spoke to had the same apprehensions about the quality of baby food, something they would not want to compromise on. “I think twice before eating the food meant for adults and purchase it only if there is absolutely no other option. How can I feed it to my baby?” was 27-year-old Rahi Gupte’s concern, who travels from Pune to Jammu at least thrice in a year with her two-year-old daughter. However, recalling Railway Minister’s gesture of providing milk to a passenger who tweeted about there being no food for his child in the train, she lauded the minister for keeping parents travelling with babies in mind. Rakhi Parsai, a public relations professional working in the city, said mothers are very particular about the quality and hygiene standards of the food provided. “The pantry of a train is not exactly clean. Even if the food is packaged, I would be doubtful about the quality unless it is a very branded company. I don’t even trust boiled water from the pantry,” she said. Rachana Jain, mother of a four-year-old, said she would prefer to carry her own home-cooked food or baby food powders along with thermos and electric kettles. She, however, felt introduction of baby boards in the toilets will help mothers while changing a baby’s diaper or clothes, as it will give privacy from other passengers. Is it a saree? Is it a jewelry set? Nope, it’s a cake! Recently, various groups on social media in Maharashtra, especially Pune, were abuzz with photos of a folded magenta Paithani silk saree, with Kolhapuri jewellery kept on top of it. At first glance, you may not find anything unusual about it. A closer look will reveal that it is actually a cake! A quick check on Facebook told me that the creator is well within reach! Tanvi Palshikar, a home baker based Kothrud, is the creator of this intricate cake, that is being widely circulated on social media platforms like Facebook and WhatsApp. Palshikar revealed that she had made this cake for one of her trusted clients Ketki Kulkarni Puranik, who wanted a customised cake for her mother-in-law’s birthday. “A couple of days earlier, we had discussed about her mother-in-law’s fondness for Paithani sarees and we decided to make this cake. She shared some photographs of the saree and some jewelry she likes to wear on it,” said 27-year-old Palshikar, whose home baking venture Cakilicious turned three this month. This unique 1.75 kg cake shows a saree neatly folded, with a pallu of golden zari with colourful peacock motifs on the folds. On top of it, a pearl-studded Kolhapuri choker necklace set with a Maharashtrian nose pin (nath) is kept — and it’s all edible and handmade! “It’s a vanilla chocolate chip cake and it was eggless. It took me three hours to bake it and 8 hours to decorate. This type of decoration is called ‘Sugar Craft’. The saree pallu or padar as we call in Marathi, is all hand painted with edible golden paint,” Palshikar said. She has not even used any molds for it. Palshikar is an interior designer by profession but took to baking after she got married. I can tell from personal experience that it takes a couple of weeks in the kitchen for you to realise the immense potential that awaits many in this business — baking and cooking. I have myself made things I had earlier thought were impossible. So I can totally relate with what Tanvi must have gone through at that time. With the support of her husband Onil and other family members, she started her own venture. Isn’t that cool… when the family supports you, nothing is impossible. She gets 50 customised cake orders in a month, where her endeavour each time is to ‘Bake your imagination’. She admitted that she did not expect it to go viral on Facebook, and is ‘amazed and flattered’. “I had no idea this was happening until I checked my phone two days ago and saw the photo. I have no words to express my happiness! It feels great,” she said. I know where my next cake is coming from! You can hunt for Tanvi’s (that’s her in the pic) Cakilicious on the Facebook as she has a dedicated page. The photo gallery will give you a peek into the kind of cakes she has made in the past. The above story first appeared in Sakal Times newspaper in Pune. Mouth Freshener anyone? The name on the packet itself freshened me up alright. When I started writing this blog post, I realised I should take some time out first to beat myself up. I am the ultimate blunder queen and it seems I have done it again. Here I am about to write about the delicious yummy food of the Andaman Islands, to tell you about the fresh seafood and local cuisine which I enjoyed there….and I suddenly realise my mistake. During my 10-day visit to Port Blair and Havelock Island, I ate so much but never had to worry about putting on weight since we walked a lot! And since we walked a lot, we ate a lot too! And in the middle of all this walking and talking and eating, I forgot to click pictures of what I was eating. I envy all those people out there who take a few moments out to click a picture of the food served on their plate before they dig in. I have always, well,… dug in. So please forgive me for not clicking pictures of Andaman’s glorious seafood. It was mouth-watering and you will just have to take my word for it. 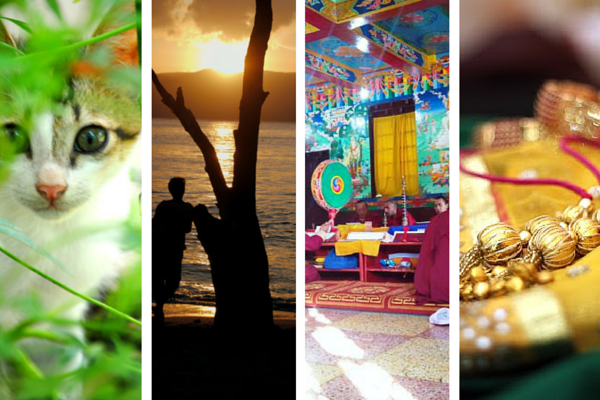 Except for these three photos here, and especially proud of the top picture. Our first meal there, and husband says, “Let’s have butter chicken.” I wanted to strangle him right there…we live in north India and all there is to eat there is Butter Chicken (and matter paneer and aloo gobhi). And I was not going to let Butter Chicken sabotage my culinary vacation. But I was surprised to see that most hotels’ menu were predominantly north Indian. As our guide Kuber later told me, Andaman’s food habits include many north Indian dishes. I was expecting it to be only seafood, but that was not the case. The seafood section of the menus in Port Blair was quite tiny and expensive. But we still made it a point to local food and snacks whenever we could. Chana Bhel, a popular snack sold at beaches. All the beaches in Andaman and Nicobar– at least the ones open to tourists– will have some small shops or vendors with a wicker basket where you can have light snacks. But in the midst of all those kurkure and chips packets, I could see bhel being sold by a couple of guys who were carrying a portable stand in which they stored the various ingredients of bhel. They had a special variety, called Chana bhel, which had boiled black chana with finely chopped onion, tomatoes, a bit of thin sev and lots of shredded coconut with spices. 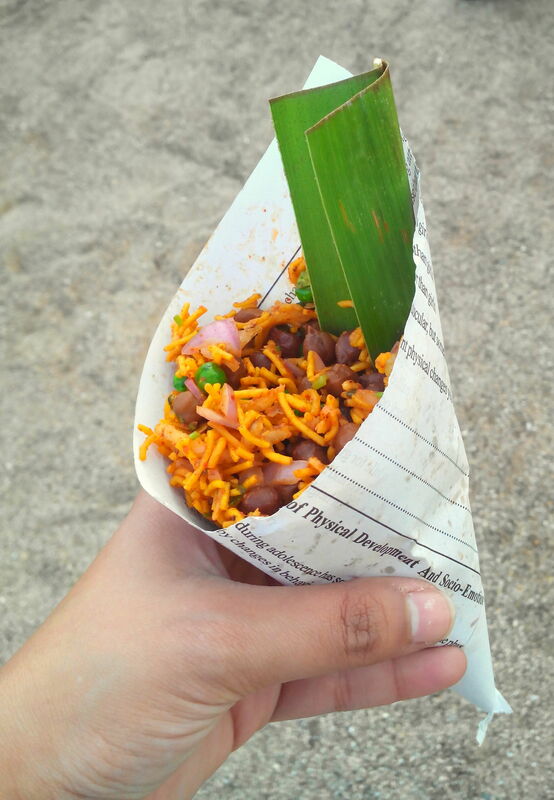 They would roll up a paper into a cone and serve this bhel in it with a banana-leaf spoon. All for Rs30. It seems Bengal Gram is very popular here, as the boiled variety was served as chakna with drinks in local bars. Another popular beach item is Kulfi. Just for Rs 20, a refreshing Kulfi would re-energise me for the long walks and ferry rides. Of course, you would find the occasional restaurant that would serve south Indian items like Idli-Sambhar, Vada, Dosa, Uttapam etc. In terms of seafood, Havelock offered tremendous varieties of dishes. It has the best restaurants and in all budget ranges — from local stalls to boho-style restos — and unless specified, they all served fish and prawns dishes. Check out Fat Martin on Beach no.5 in Havelock, where I had the most awesome Grilled Tiger Prawns with Garlic Butter sauce. There are many other good eating joints there, like Anju Coco and Full Moon Cafe, that serve delicious continental seafood. 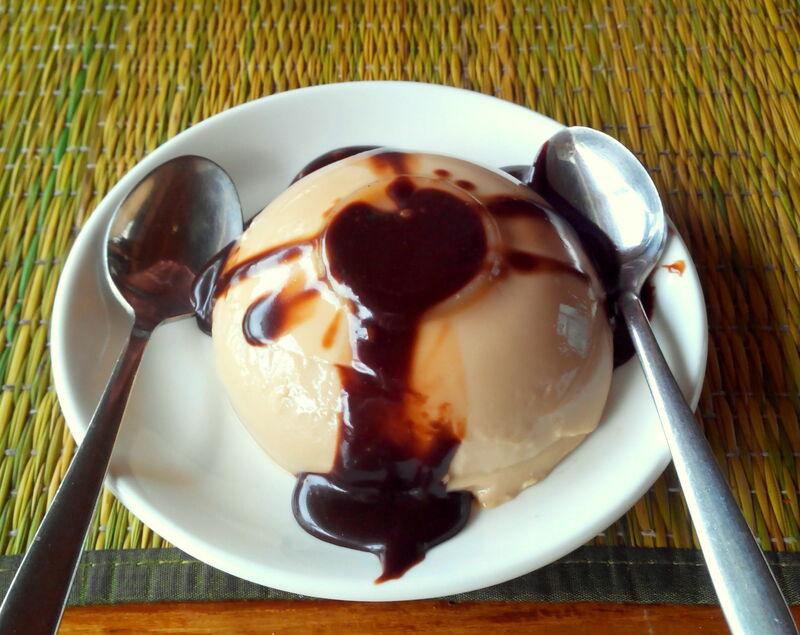 Coffee flavoured Panna Cotta with Chocolate sauce at B3. At the Havelock jetty, check out B3 — Barefoot Bar & Brassiere, I am so proud to say that the fish steak served with salad was an absolute delight. After finishing a good meal off with a cheesecake and panna cotta, there was only one thing left to do — sleep. Now B3 is an open air restaurant on situated on the first floor, and there is a constant breeze that caress you. A full tummy and a breeze is a heady mixture for us Indians, who love their afternoon nap. But obviously, B3 is not about to let us Indians go off to sleep on their long benches, not when there are people waiting for you to vacate that bench. But I have to admit, we had the best meal in small dhabas where the local drivers and workers eat. We had this homely food twice- first on our way back from Jolly Buoy Island and the other time while returning from Baratang Island. Now there is fixed meal menu at such dhabas— steamed rice, with daal, sabji and papad. For non-vegetarians, sabji is accompanied by fish fry or fish curry. Oh by the way, did I mention that you can have unlimited rice and daal? (I love how multiple servings is called Unlimited in India.) And all this for mere Rs 100! And later, quench your thirst with some coconut water. You will find many vendors who would open up a green coconut on the spot and slip in a straw. Once you are done drinking the water, they would crack it open and give it back so that you can eat the tender white coconut (called malai in Hindi). I asked a vendor, out of curiosity, what they do with all these empty coconut shells. He told me that they bury these shells with the purpose of making manure, which would be ready in an year’s time. Kanda Bhajji (Onion pakodas) served with hot garlic chutney at the Chiplun Bus Stand canteen. 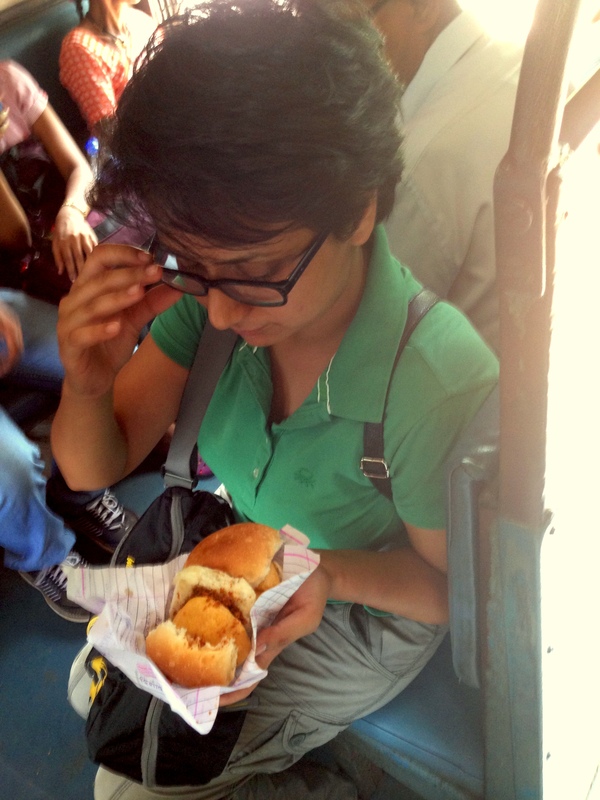 Two tasty vada pavs for Rs 10? Yes, that is what I got in the passenger train from Chiplun to Khed. 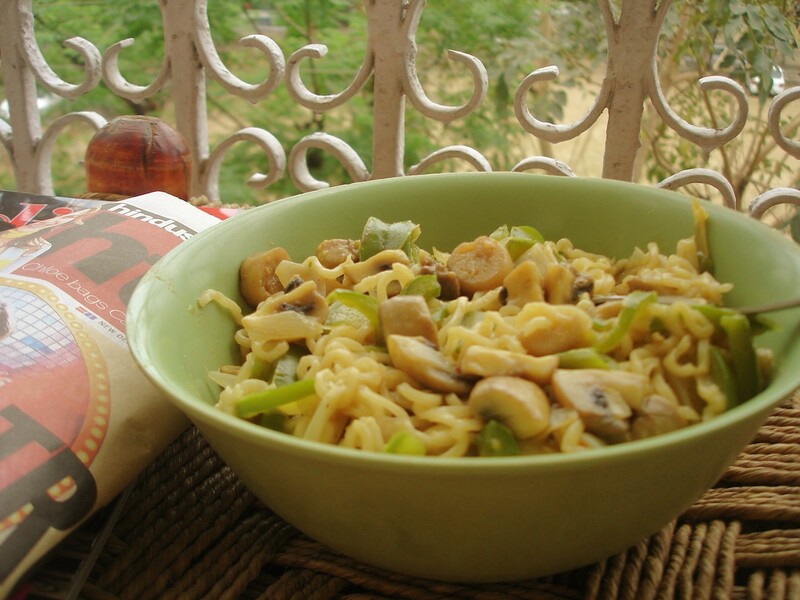 It sounds strange, but inspite of being Maharashtrian, I hated Maharashtrian food as a child. I used to think my mom is making up names of dishes and trying to get us to eat tasteless stuff. 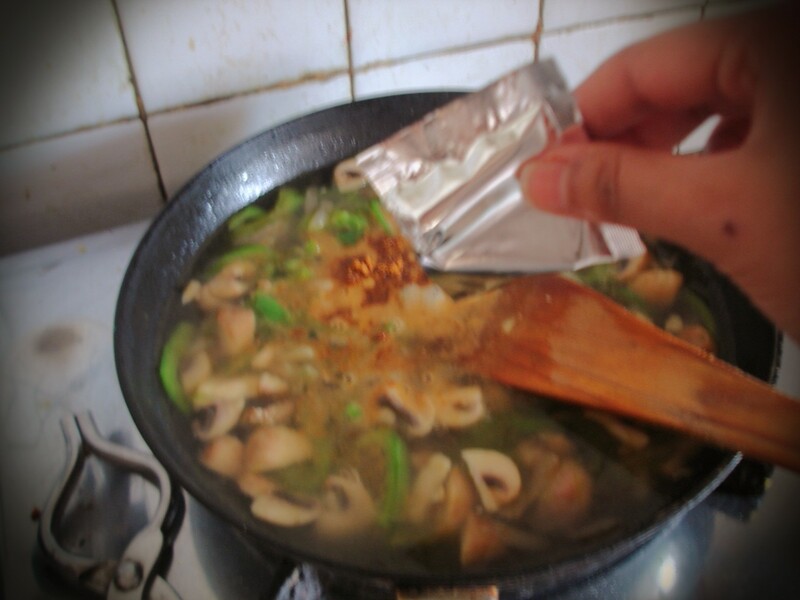 At that time, food qualified as items which my classmates would bring in tiffin… nothing else. But now, my vote for comfort food goes to Maharashtrian cuisine only. On a recent trip to Maharashtra, Mumbai and Konkan area to be specific, I had a chance to enjoy simple and nutritious vegetarian food, which was absolutely delicious. In north Indian cities, 70% of the menu at a vegetarian restaurant would be dominated by Paneer (cottage cheese) dishes. Which was why here it was so refreshing to see veg restaurants with NO PANEER at all. 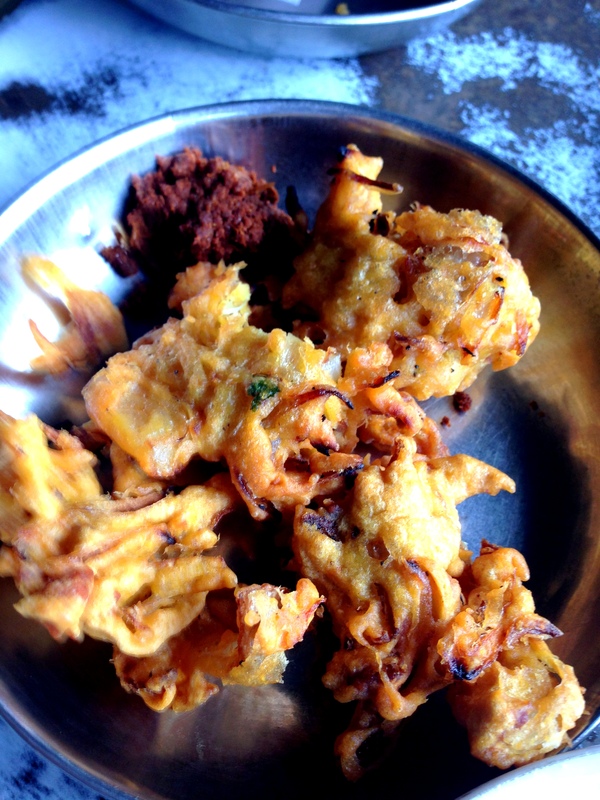 They would serve stuff like kanda bhajji ( in pic), thaalipeeth, upma, solkadhi (which is a coconut milk-based drink), poha, usal, pakodas, vada pav, dosa, idli sambhar, misal pav, kacchi dabeli, Kolhapuri veggies etc. They add coconut and a pinch of sugar into almost everything they cook. And it tastes awesome. So if you are in that state, try out the local food, instead of searching for burgers and pizzas. My sister just had a baby boy and I was immediately pressed into service (perils of not having a job). And I noticed that her diet after giving birth changed drastically — it was a diet meant to speed her recovery and provide nutrition to her and the baby. I can’t claim to be an expert on pregnancy and birth related issues but here is what my brother-in-law told me about the food that women eat postnatal. He knows it better and is currently on paternal leave (hence the title of this post). 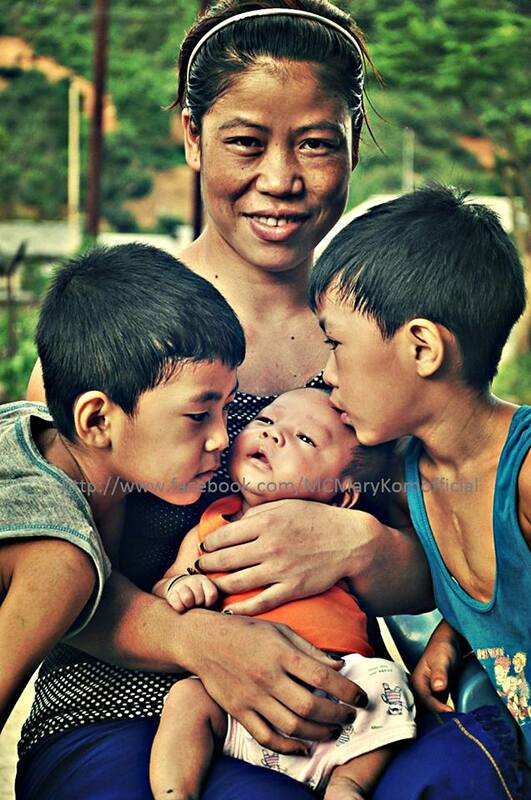 India’s Olympic bronze medal winner, boxer Mary Kom with her kids. Photo courtesy: Mary’s Facebook page. North-Eastern region: There are seven states in that region and Olympic bronze-medalist MC Mary Kom belongs to one such state. This feisty boxer has three boys (including twins). She gave birth to her third baby recently and I asked her what was her diet like. She belongs to Manipur, a state which everyone in India knows to be a pork-loving state. But Mary says she only had “boiled vegetables and food with no chillies, masala and very less oil”. Another friend tells me that in the state of Assam, women are given boiled fish and chicken in tomato or bottlegaud curry. Southern India: The four states in Southern India — Andhra Pradesh (now divided into two states), Karnataka, Tamil Nadu and Kerala, have more or less same type of weather. That predominantly decides what a woman eats, as that same food might not work for you anywhere else in the country. She remembers being given a paste of rice, ghee and six other ingredients, which is called “Ashta Choornam“. Maharashtra/ Madhya Pradesh: A new Mommy is given simple food which has no masala or spices. Sheera or Kheer is a standard dish which is rich in fat and carbohydrates. Garlic is absolutely essential in all dishes. Since the woman can’t eat pickle, an easy way to bring some flavour in an otherwise bland meal is to serve raw coconut chutney with garlic and jeera powder. Leafy vegetables in lunch everyday is a must. Dalia is also very popular. Rajasthan: Ajwain (Carom seeds) is a herb which is supposed to help with digestion and so it is a new mommy’s preferred home-made concoction. It is boiled in water with jeera (Cumin seeds) and the woman is supposed to drink that every time she feels thirsty. 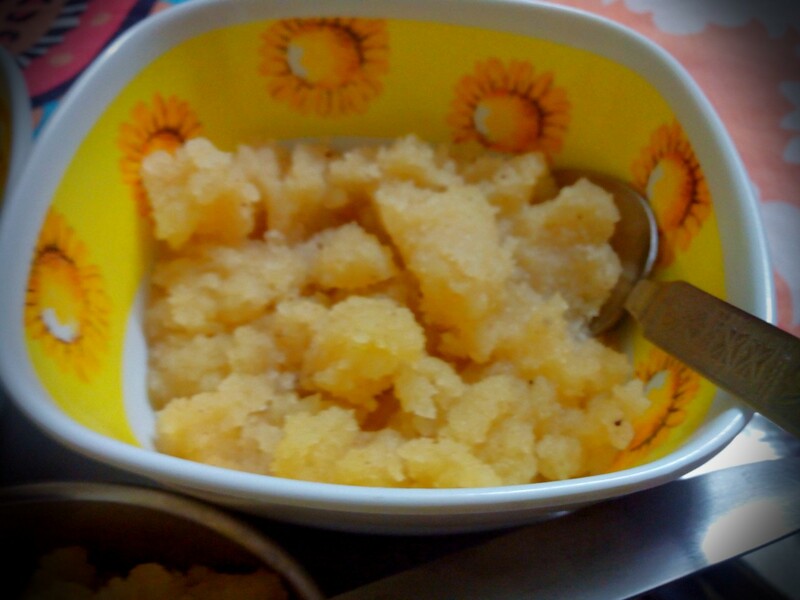 Another way is to mix Ajwain with ghee and sugar to make a thick paste. Gond ka laddoo is given in winters to give the body some warmth. If you are visiting Indore and do not go to Chhappan Bazar, I swear to god I am going to hunt you down and force feed you all the delicacies sold there. This commercial city in Central India happens to be my home town and I shudder at the thought of not having grown up eating chaat, Paani Puri, Dahi Puri, Usal Pohe, Chhole Tikki, Masaledaar Noodles, Pav Bhaji, Dhokla and Benjo. Now there is this street in Indore called Chhappan Dukan (literally, 56 shops) which sells the most delicious street food in India — most of it vegetarian. And Johnny Hot Dog boasts of a sizable footfall. 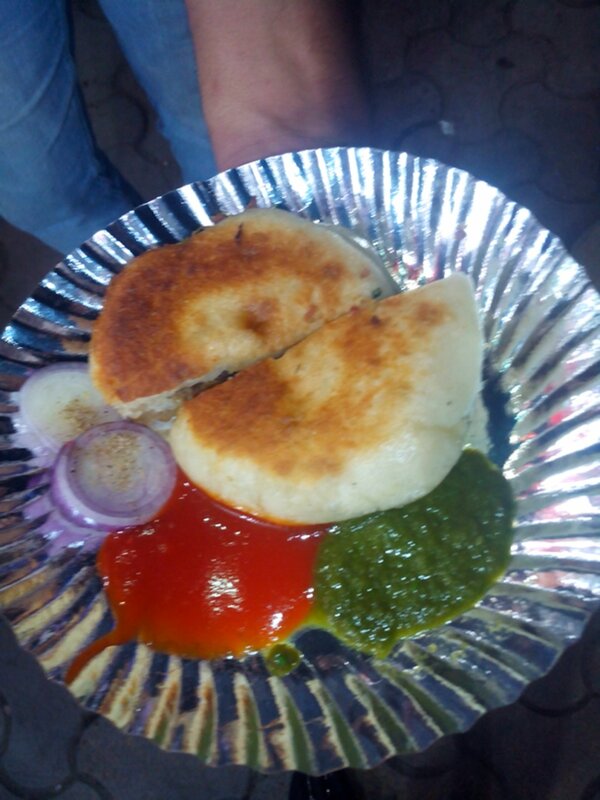 Their specialty is benjo, which is nothing but an omelet between two buns served with seasoned onions, tomato ketchup and green chilli chutney. Worry not if you are a vegetarian, they have a veg burger with a lip-smacking potato patty. Indore is mostly famous for veg street food, so you can understand why so many youngsters love to hangout at Johnny Hot Dog as it serves the most enviable mutton and chicken benjo. When I was in collage, a veg or egg benjo would cost Rs15 (roughly 25 cents), but now it has gone up to Rs35. Still, it is still quite cheap. Oh! Forgot to tell you, there are two shops by this name, one at each end of the street. Rumour has it that the one which is at the junction of this street and MG Road is the original one, but the one at the other end is bigger. Both are equally delicious so worry not. Breakfast in Indore means just one thing… Poha/Pohe. A very easy to make and digest dish, it somehow inspires an Indori to wake up in the morning, who would otherwise not leave his bed at all. Kiosks, sweet shops, thelas… you name it, every corner of this commercial capital of central Indian state Madhya Pradesh will have Pohe along with chai, usal or jalebi. 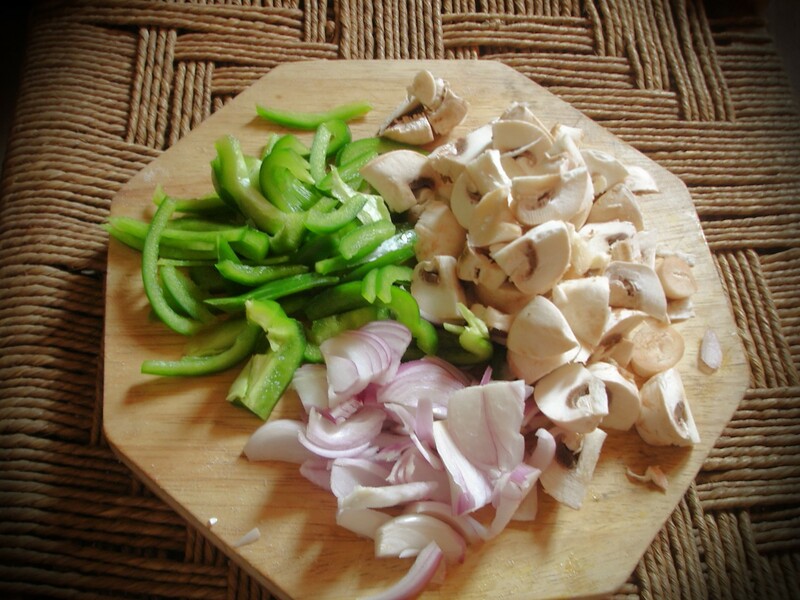 Standard toppings include sev, kanda, jeeravan, dhaniya leaves and boondi. Yummmm…. 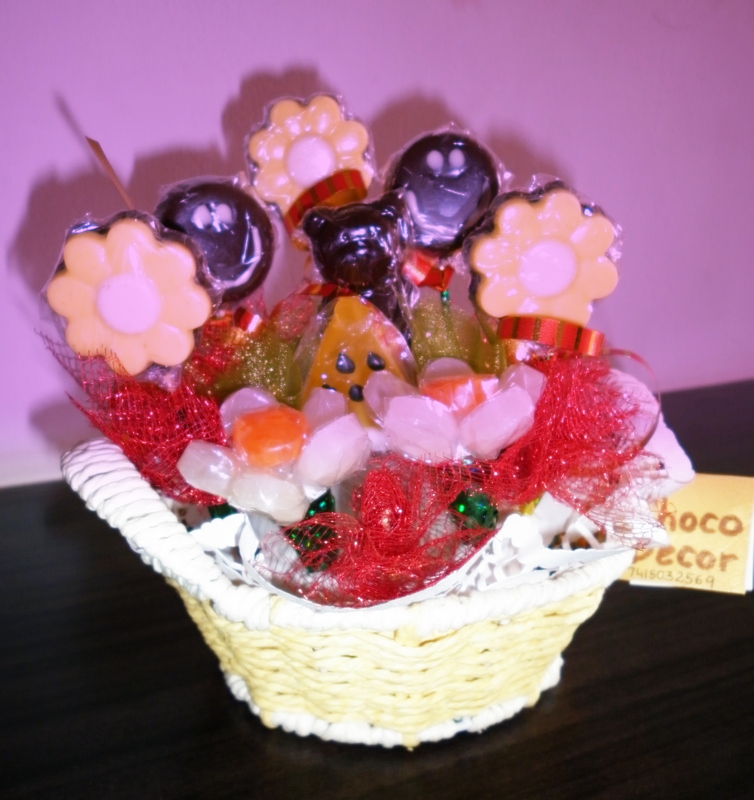 My sister Rachana told me about chocolate bouquets an year ago…trust me before that I had no idea any such thing existed. 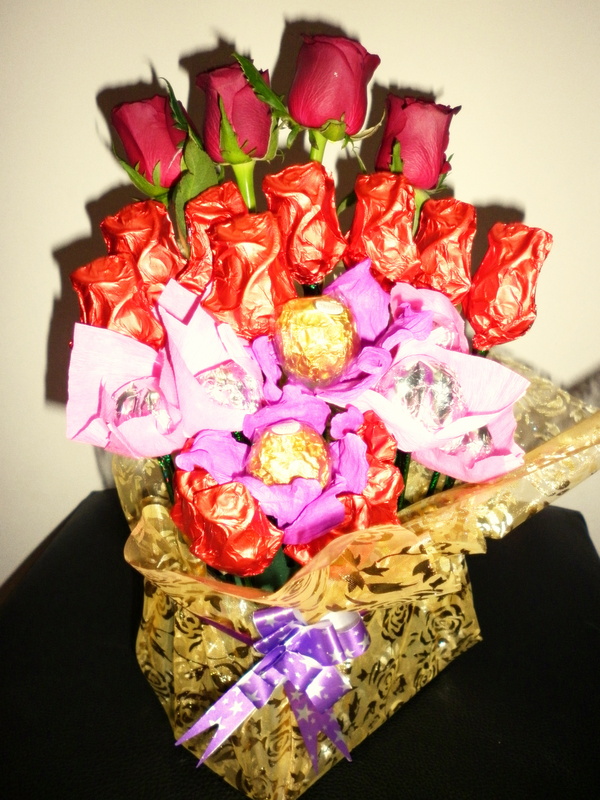 I am strictly anti-bouquet (the flower kind) and when I heard about chocolate bouquets, I was honestly thrilled. 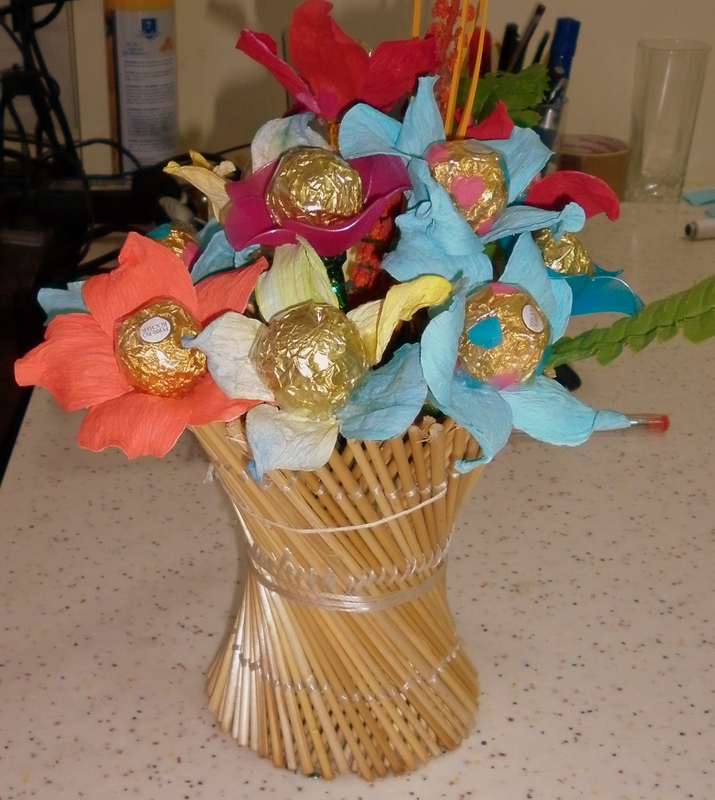 The idea was quite appealing, instead of flowers, you have decorated chocolates sticking out of a bouquet. Pluck them, eat them and either throw the rest away or recycle it. Cool na? So Rachana was going through a very bad phase in life and wanted a change, so she went to Mumbai to learn how to make chocolate bouquets. 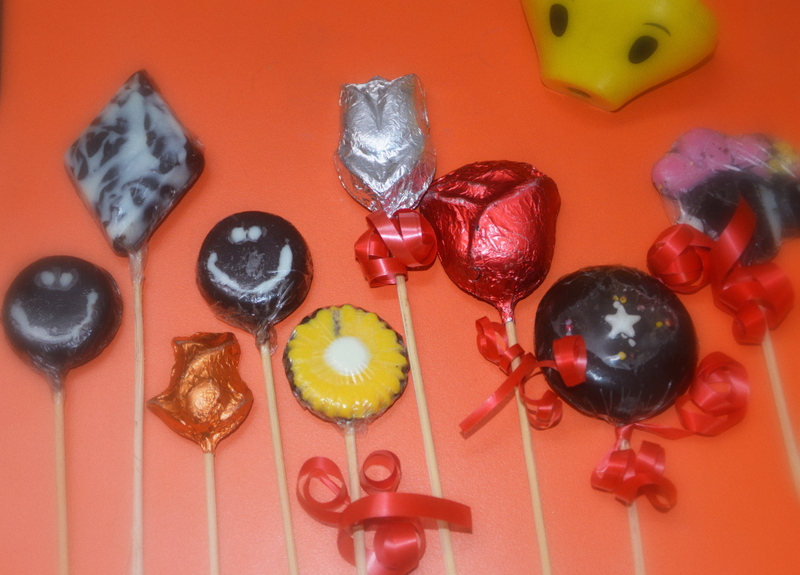 She also learned how to make chocolates of different shapes using moulds and then wrapping them up in colourful foils. She would then fashion them into bouquets of different shapes and designs. She came back to Bhopal and started this service — Choco Decor— where she would take orders from people near her house. The smallest bouquets cost something like 250 and had around 10 chocolates. I went to visit her a couple a months ago and learned that she was to deliver a lot of bouquets and assorted chocolates soon. She found a willing slave in me and we sat down to set up our own mini production line. 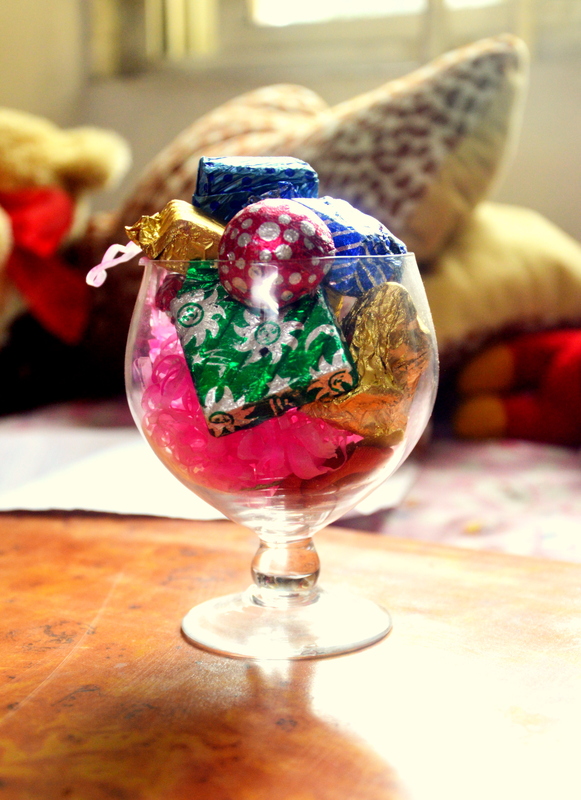 I would melt bars of chocolates and pour it into moulds shaped like hearts, stars, roses, tulips, smiley faces etc, and Rachana would cool them down in the freezer and them wrap them in foils and decorate the bouquet. Button Mushrooms: Five pieces for more. Add ons (optional): Peas, carrots, ginger-garlic paste, spring onions and tomatoes. 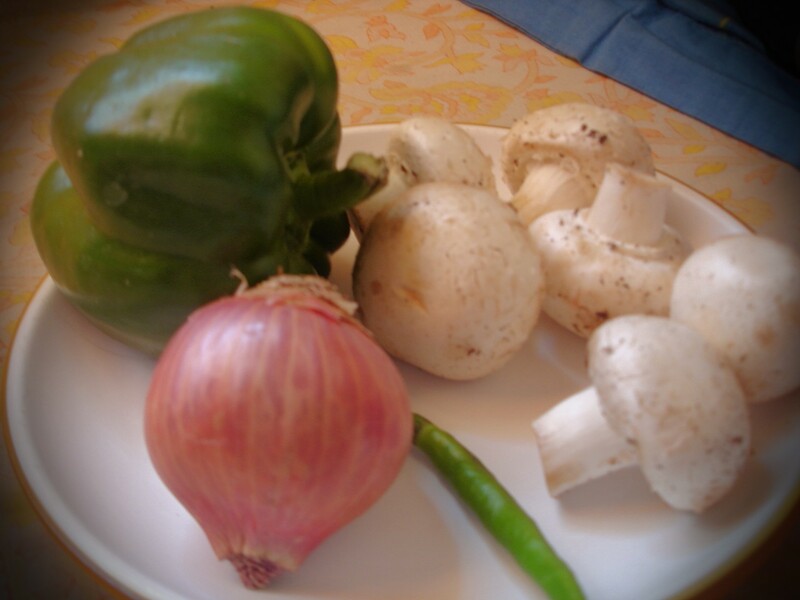 Wash your vegetables properly, especially the mushrooms. I am going to rush through the initial part, assuming you must have mastered that stage. 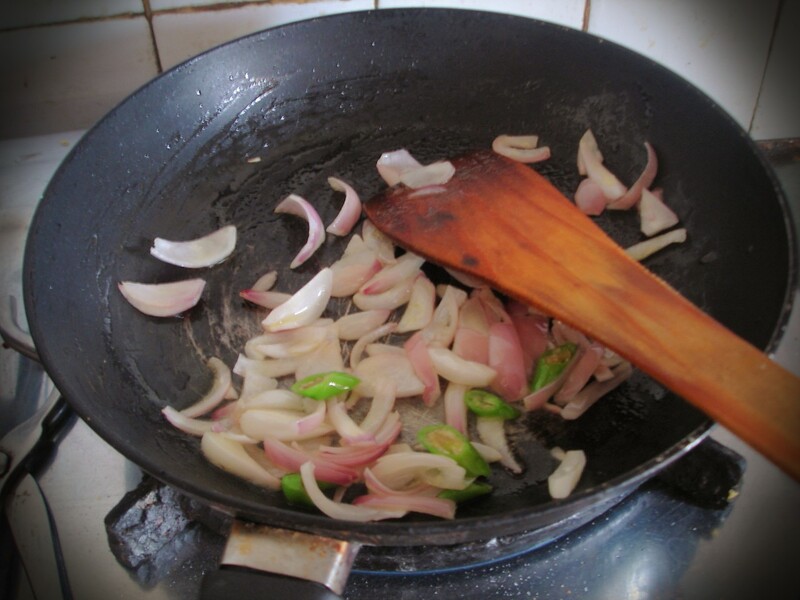 Oil in pan, saute onions, add capsicum and green chillies when onions turn pink (thats the drill). 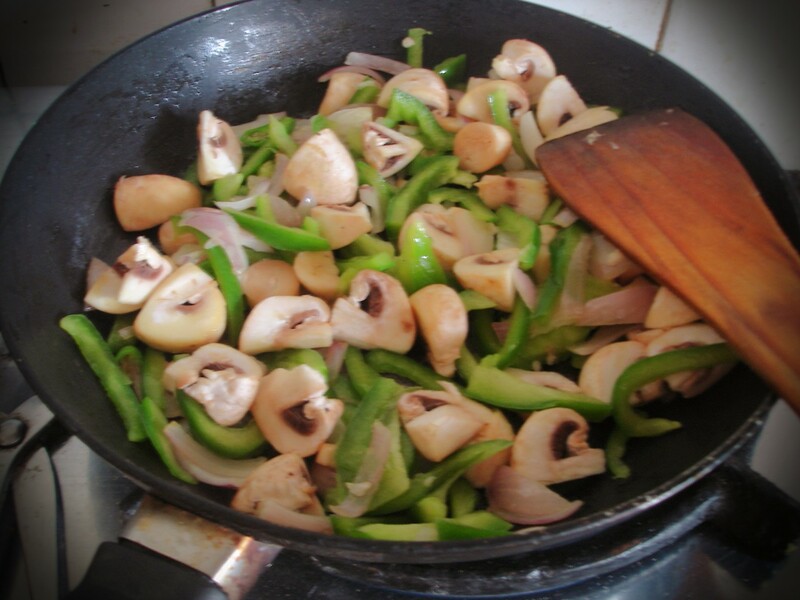 (Above) Add mushrooms to the pan. The peculiar thing about mushrooms is that they lose water when heated. So you don’t have to add water for it to cook, it cooks in its own water. But maggi needs water to cook 🙂 so Add one and half cups of water and the tastemaker. A little salt will help. 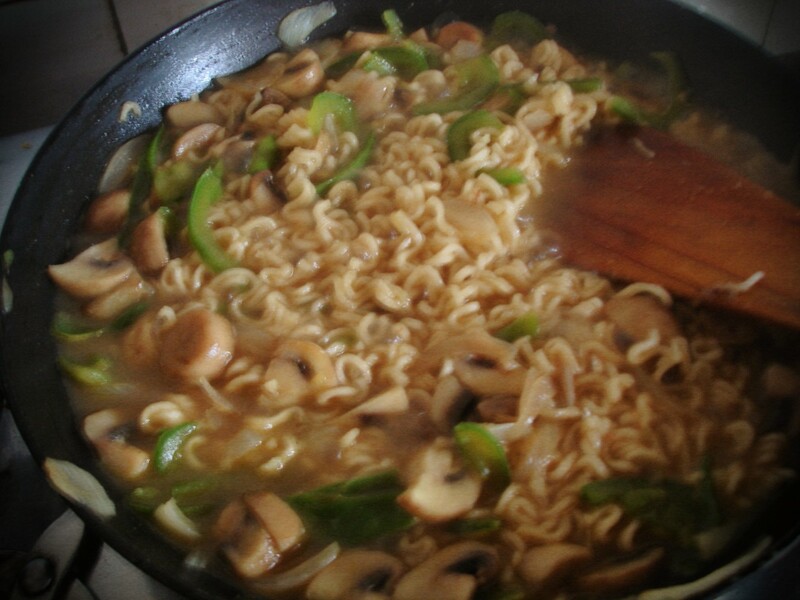 Add maggi — the easiest part. 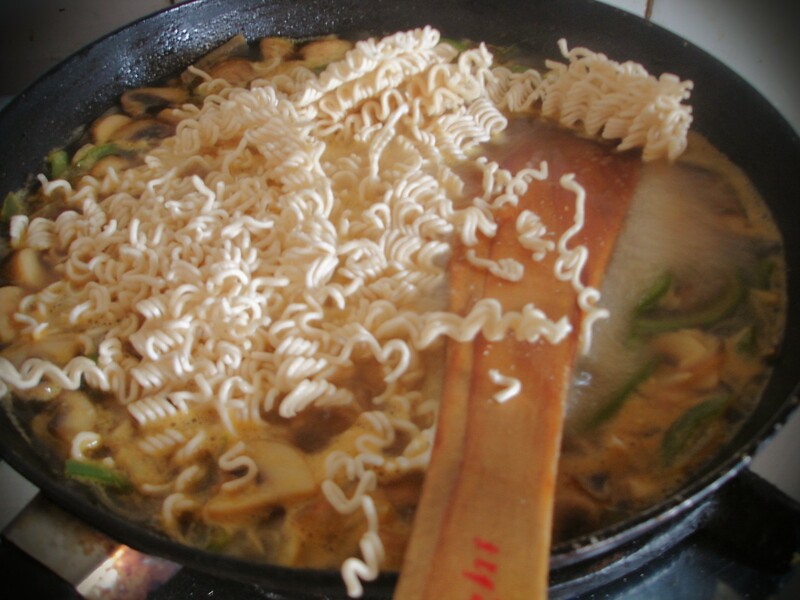 Cook till its soft and there’s no water left in the pan. Let a small cube of butter melt on it… and enjoy!